Cristobal Colon is the biggest of Bermuda's shipwrecks. This massive Spanish cruise liner was 499 feet long and three decks high. This transatlantic vessel was built in 1923 and operated between New York and Central America. Cristobal Colon was one of the most luxurious cruise ships of her time. It crashed into the coral reefs off the Bermuda’s North Shore as the captain wrongly interpreted an offshore communication tower as the Gibbs Hill Lighthouse. At that time, she was traveling with 160 crew members from Wales to Mexico under the command of Captain Crescencia Delgado. Cristobal Colon had a very interesting story. Few weeks prior to her destruction on Bermuda's reefs, this Spanish ship was bound for Spain from Mexico with 344 passengers aboard. As the Spanish Civil War broke out, she was not permitted into the port in Spain as the port was under control of the rebels. She was ordered to sail to France. French authorities refused to permit the landing of Spaniards, so the Cristobal Colon anchored in St. Nazaire awaiting further orders. On August 15th some passengers were permitted to disembark at Nates France, before the Cristobal Colon sailed for the Spanish harbor, Santander. But many believe that the Cristobal Colon was actually steaming to Mexico to pick up arms for Spain's war effort and was wrecked on a reef near Bermuda. The crew from the wrecked ship had to face further bad luck as they came to shore in Bermuda. It seems that Bermudians disliked them because they could not understand their language. The Bermuda Government also feared that Bermuda would have to pay for their food and housing without getting any returns. But the Spanish Government ignored Bermuda's communications about the crew. Mexico too refused to take any responsibility for their welfare. Bermuda government, realizing that the unwelcome guests would be with them for a while, put the men to work. The crew repaired Barry Road and restored the Gates Fort in St. George. Finally on the Christmas Eve, the Spaniards boarded a ship for La Pallice France towards their homeland. Some sources claim that they were all executed by the Franco government upon their return. The wreck of the Cristobal Colon sat high on the reef only eight miles from Royal Naval Dockyard for some time. This allowed for the easy salvage of some of her fine furniture, paintings and fittings. In fact, today you can find items from the wreck in many homes in Bermuda. Although many of these articles were bought by the locals at public auction, many others were pirated. Every night locals would take their boats to the wreck and comeback with bags full of loots. Literally hundreds of Bermudians took part in this crazy piracy; only 13 of them were ever caught. The British eventually sank the ship's empty shell by using it as a practice bombing target during the World War II. Today the wreck lies 55 feet under the water surface. It is a haven for varieties of colorful reef fish. The Cristobal Colon, one of Bermuda's famous shipwrecks, is scattered across large area of the sea floor, offering endless hours of fascinating exploration. 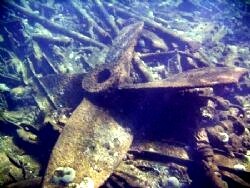 Check out shipwreck map to get an idea about the location of this wreck in the Atlantic.